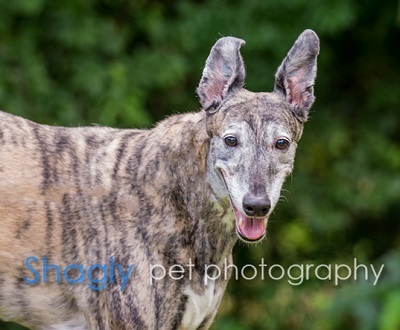 Trudy is a brindle female who is approximately 8 years old. Her tattoos are very difficult to read, and may be double tattooed. Trudy and Milo were received from Fort Worth Animal Control as part of a cruelty seizure - they were thin and covered in ticks. They were found in a vacant lot in a makeshift holding pen in absolutely filthy conditions. 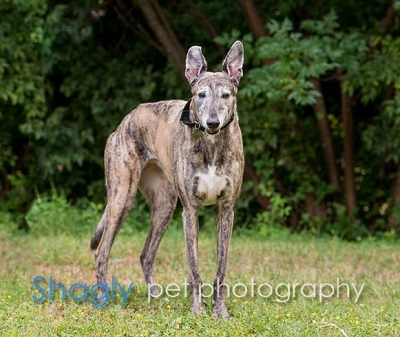 Thankfully, Trudy tested negative for heartworms when she arrived, but she suffered from low platelets and had a positive titer to Ehrlicihia Canis. She has been successfully treated for both and has completed her medical procedures. Trudy was in a home for three years, but has returned to GALT due to a severe owner health emergency. She is not cat tolerant. Trudy is guaranteed to reduce eye-strain since she'll bump my elbow and put her head in my lap for some petting if I've been on the computer too long. She loves to be in the same room with me and is very affectionate. Trudy has great house manners. She loves to play with other dogs, and continues to ask her foster brother to play even though he's a sedate soul and doesn't want to. She likes collecting her squeaky toys to shake and toss around. Sometimes she'll collect my slippers on her bed too, but just to have them near her - she doesn't chew on them. She jumps into action if she hears keys or leashes jangle, and keeps the rugs slightly askew in her haste to move from room to room. She's a "talker" and will definitely let you know what she's thinking from time to time. 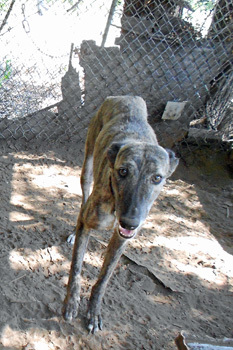 Trudy loves activity and enjoys having children around - she's calmly curious about them.